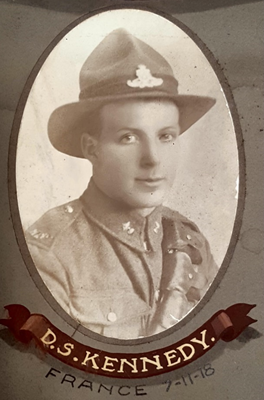 This blog summarises our just published article on the mortality and morbidity impacts of the First World War on the NZ population. While much is known about the large health burden of this conflict (especially for the direct participants), there are still various knowledge gaps eg, for the health impacts on the home front. The ongoing digitalisation of all the military files and key data abstracted from them should make it easier for researchers to fill these knowledge gaps in coming years. According to the Roll-of-Honour dataset for NZ military forces in the First World War (WW1), the last NZ soldiers “killed in action” died on 7 November 1918, one hundred years ago this year of writing. They were Donald Stewart Kennedy (see photo below), Frank Gardner, and Andrew Mather, and were all killed at Le Quesnoy in France. They died four days before the war officially ended. The centenary of these deaths and this war’s end seems an appropriate time to review its health impacts. A summary of the health impacts for military personnel who left NZ for the war is detailed in Table 1 (a simplified version of the one published in our article , full free text online). The major features were the heavy mortality burden (over 18,000 deaths), the high level of wounded personnel (41,000), and the long-term burden of disabilities as suggested by war pension payments to veterans in 1921 (32,000). The war also cast a very long shadow and NZ military personnel kept dying from war-related causes for many years after the end of the war. Such deaths were because of their wounds and from the psychological impacts of their experience (contributing to suicide and alcoholism etc). Some morbidity impacts could have been lifelong eg, from missing limbs, residual shrapnel/bullets that were never removed, permanent lung damage from poisonous gas exposure, and from post-traumatic stress. Burdens of non-fatal disease were also high, with sexually transmitted infections estimated at 12,000 cases (albeit probably an under-estimate). A summary of the health impacts from the war for those in military training and for the 1.1 million civilians in NZ is also detailed in Table 1 (and our full article  for additional details and references). A major feature was the disease outbreaks in military training camps from the influenza pandemic in 1918, but also for conditions such as meningitis. For civilians, there was the psychological impact from losing relatives, friends and colleagues (eg, 17,612 “dependents” lodged war pension claims). Qualitative historical research about WW1 widows has shown that grief was widespread and modern research has also shown an important increased mortality risk from the shock of being widowed . When this occurred at the time a woman was pregnant, the shock may have directly harmed the fetus and resulted in reduced subsequent lifespan of such individuals, given evidence from a large study in France on this effect . The significant physical harms to civilians included the role of the war in accelerating the speed at which the 1918 influenza pandemic spread and the spread of sexually transmitted infections. There was also the possible adverse impact of fewer health workers in the country providing health services during the war, and possibly poverty-related health effects from the rising cost of living during the war. Number of military personnel who died up to the end of the war on 11 November 1918 16,703 Fairly well clarified. Total official deaths of military personnel from the whole war (including deaths after the armistice) 18,166 Still not counted in this total are subsequent premature deaths (eg, from suicide) and the war-related deaths of those who signed up to other militaries (eg, the UK or Australia). Lifespan loss for military personnel Up to 10 years loss in lifespan per male birth cohort. Fairly well clarified in a detailed study of NZ birth cohorts by Statistics NZ. This 10 year loss was for the worst affected birth cohort (born in 1894) . But on average the loss of lifespan for those NZ military personnel leaving for war in 1914 was 8.3 years . Number of wounded personnel 41,262 This total is unlikely to include minor wounds that did not require medical attention. Non-fatal illnesses Not fully quantified but at least 5 cases of sickness per 1000 personnel per week in some settings There is uncertainty around the scale of minor illnesses which may not have been recorded in the military files (eg, skin infections). The precise burden of sexually transmitted infections (STIs) is also unknown. Incapacitated (reflecting more severe injury/illness) 31,764 NZ veterans on war pensions in 1921 (for disabilities) This number is less than the 41,262 wounded, presumably since some recovered, did not try to claim a war pension, or were denied a pension. The extent to which these incapacities continued through the rest of the lifespan of these personnel is not well defined. Unequal burdens by ethnic group (of those going to war) 3.9 times the disease death rate for Māori soldiers The cause of this differential, along with that for Pacific soldiers (relative to NZ European personnel) is not well defined. Deaths in military training camps in NZ (disease, accidents, suicides) 441 Fairly well clarified. But the degree these were readily preventable with knowledge of the day is not well described. Non-fatal illness in military training camps in NZ Eg, 4104 hospital admissions in 1917 There is uncertainty around minor conditions which would not have involved hospitalisation. Psychological harm for those back in NZ Unclear, but 17,612 dependents lodged war pension claims This burden is very uncertain. Pandemic influenza reaching NZ via troopships – This impact is speculative but it seems likely that the troopships may have accelerated the arrival of the pandemic to NZ – giving less time for a coordinated public health response. STI spread to those back in NZ – Evidence around this is fairly limited. For instance, on data on infant deaths from syphilis. Hazardous new behaviours – smoking – The war almost certainly resulted in markedly increased smoking uptake (we estimate that only a minority of soldiers did not smoke). Possible health impacts from health workers being out of NZ – Unclear, but plausible given the large numbers being overseas. Possible health impacts from war-related economic impacts Not fully quantified (but in 1921 war loans were £81.5 million) While the cost of living (including food prices) increased through the war, the adverse impact that this may have had on health is unknown. Overall, this summary suggests a severe health impact from this war on New Zealanders, especially the military personnel involved. 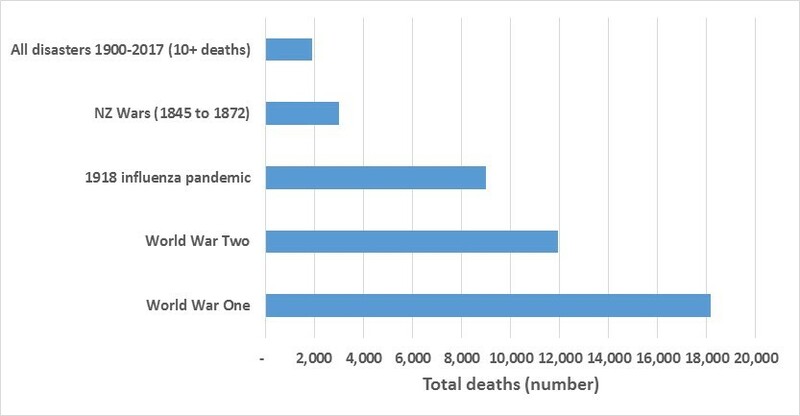 The direct mortality impact far exceeds that for other impacts on NZ from: natural hazard events such as the 1918 influenza pandemic, the Second World War and all the sudden major mass fatality events in NZ history since 1900 (see Figure below). This war was probably the greatest destroyer of NZ families ever – though the influenza pandemic of 1918 was more focused in terms of deaths within a brief period of time. Civilians also suffered from this war, but this health burden is much harder to quantify. Nevertheless, this war also stimulated a range of advances in medical and surgical services, psychiatry and public health – which benefited participants of the war and the civilian population in subsequent decades. While much is known about the health burden of this conflict, knowledge gaps remain for the health impacts on the home front as well as for the participants themselves (eg, in terms of the details of the non-fatal injury profile). The ongoing digitalisation of all the military files and key data abstracted from them should make it easier for researchers to fill these knowledge gaps in coming years. We detail some of the specific unanswered questions in our full article  and its Supporting Information. Elwert F, Christakis NA. The effect of widowhood on mortality by the causes of death of both spouses. Am J Public Health. 2008;98(11):2092-2098. Todd N, Valleron AJ, Bougneres P. Prenatal loss of father during World War One is predictive of a reduced lifespan in adulthood. Proc Natl Acad Sci U S A. 2017;114(16):4201-4206. Statistics New Zealand: A History of Survival in New Zealand: Cohort life tables 1876–2004. Wellington: Statistics New Zealand, (with online tables at: http://www.stats.govt.nz/browse_for_stats/health/life_expectancy/cohort-life-tables.aspx); 2006. Wilson N, Clement C, Summers JA, Bannister J, Harper G. Mortality of first world war military personnel: comparison of two military cohorts. BMJ. 2014;349:g7168. This entry was posted in Uncategorized and tagged first world war, historical epidemiology, morbidity and mortality by dayhi34p. Bookmark the permalink.